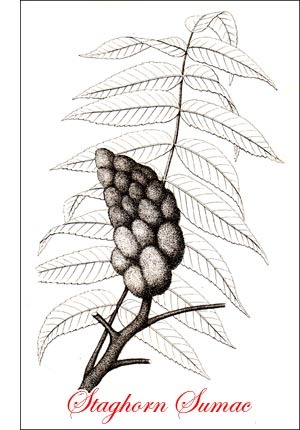 Staghorn Sumach, Hairy Sumach (Rhus hirta, Sudw. )A low, flat-topped tree, 30 to 35 feet high, with branches stout, erect, forked many times, and densely velvety. Bark smooth, brown; hair on branches soft, long, and changing from pink to green the first year; later, dark, short; shed the third or fourth year. Wood light, coarse, soft, brittle, but satiny when polished, green streaked with orange. Buds pointed, in summer covered by leaf base, in winter almost buried. Leaves pinnate; leaflets 11 to 31, narrow, pointed, serrate, dark green above, pale to white beneath; velvety; autumn colours scarlet, orange and purple. Flowers, June, inconspicuous, greenish, in dense, conical, hairy clusters, the two sorts on separate trees. Fruit tiny, globular acid drupes, densely hairy, red, in large, compact panicles, which remain through the winter. Preferred habitat, uplands and gravelly banks. Distribution, southern Canada to Winnipeg; south to Georgia and Mississippi. Uses : Planted as an ornamental for its foliage and fruit. Wood used for walking sticks, and for inlaying boxes, tabourettes and other fancy articles. Twigs used as pipes to draw maple sap from the trees. This largest of Northern sumachs is constantly seen on railroad embankments, in fence rows, and along the highways of wooded regions. In the summer its fern-like foliage covers all the ugliness of the most unsightly bank, and lifts among the green its fine clusters of ruddy or pink blossoms. In the fall these are lost sight of amid the glory of the leaves, which turn to all shades of orange and purple and red. For weeks they flame and glow in the soft autumn sunshine, then fade and fall, and the bare antlered branches, like candelabra, hold aloft the pointed red fruit clusters which burn on with gradual abatement to the middle of winter. The glory of the staghorn sumach's colouring makes it one of the most desirable of ornamental trees for fall and winter colour effects. Its habit of spreading by root suckers makes it objectionable for planting except in situations where the trees can spread unchecked, and the massed effect of the foliage can be enjoyed at some distance. The fern-like leaves are much larger if the plants are cut back severely each spring. For screen and border shrubs this species is very satisfactory.